I'm glad I broke Crane's nose, too. Anyway, this video is amazing, thanks. I've always wondered about Telltale's first take on TWAU and I'd love to know more about the original story (but of course I love the final version). goddamn Crane sounds like a real "Nice guy". If you read through the dialogue files, the Wachowski scene makes... somewhat more sense. From what I can gather, Bigby and Faith were in Toad's car, Bigby crashed it, Police Officer Wachowski investigated, Bigby and Faith acted as boyfriend and girlfriend, and it goes on. Speech=[pickup1] I could go for a drink right now. Speech=[pickup1] [low but flirty]Is that an offer? There's also some evidence of a hub scene. Speech=[pickup5] I keep waiting for this movie fad to die out. Speech=[pickup5] [reading poster] "Mongoose. Only one thing can kill a viper." Speech=[pickup5] In the three hundred years since we've been here, this is the one part of town that's just never improved. And no one cares. Ooh man I would have really enjoyed a scene where you are giving out an alibi. I'm glad I broke Crane's nose, too. Anyway, this video is amazing, thanks. 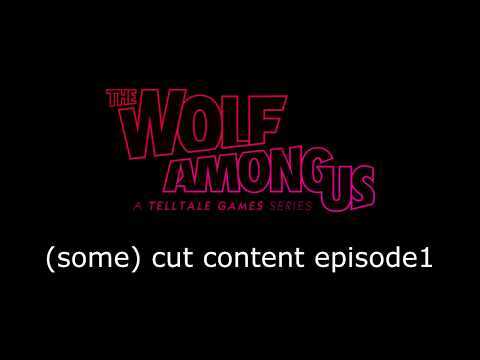 I've always wondered about Telltale's first take on TWAU and I'd love to know more about the original story (but of course I love the final version). Yup, thats what I was thinking. 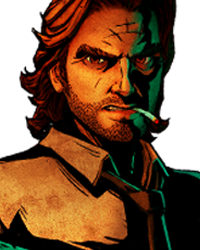 but Bigby can also say something like "I fell 3 stories onto it.. I should be in the hospital right now" so maybe it was supposed to happen right after you save her from the Woodsman? I'm gonna look into it some more. Yeah, now that I think about it, crashing the car might have just been part of the fake story that Bigby and Faith were telling Wachowski. I think in the original scene you could have told Wachowski the truth (falling out the window) or make up a lie (that you'd crashed after swerving to avoid a dog). There was also the opportunity to bribe Wachowski. And yes, it's definitely the scene after the fight with the Woodsman. The scene in the game is just a tiny fraction of what they originally intended.